Plenty of great beer continues to flow at events here as October begins to wind down. Get the last of your Oktoberfest on while you can. 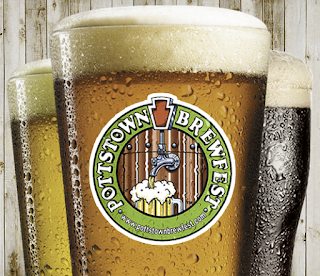 Would you like to have my tickets to Pottstown Brew Fest? On Saturday, October 28, the Norco Fire Company is playing host for the third year to the Pottstown Brew Fest. I can't attend but made arrangements with the organizers to pass the two tickets on to one lucky winner. How do you put your name on them? Well, if you've been around here long enough, you know of my fondness for numbers. Do the math, do it correctly, be the first to provide the correct answer (in the comments section), and those tickets will be in your pocket. What number day of this year is the Pottstown Brew Fest taking place on? Take the result of all the above multiplication and subtract from it the ZIP Code of the Norco Fire Company. What's the answer? First correct answer wins! Buckle up and keep your hands inside the ride and on your beer at all times. Here comes a bunch more beer. Like, over 40 beer events worth bunch of beer. Here's wishing all local brewers visiting Colorado for the week all the best at Great American Beer Festival (GABF) judging competition. The rest of us will keep up our end of the deal back home and drink all your beers while you're gone. Here are just a few ways that we can do just that. Was it a light week? In some ways, yes, but in many ways just the same beer-drinking week as any other week. But, there was just one that stood out, way out. Brewed by some of Philadelphia's finest retailers of Sierra Nevada beers in 2010 at the brewery's Beer Camp in Chico, the base beer (ExPorter) was aged in Pinot Noir barrels for nearly a year at famed Russian River Brewing Company and revealed as ExPortation in 2011 in time for Philly Beer Week. Thanks to a heads-up from Matt Guyer (Beer Yard) and Gary Fry (Craft Ale House), there was a bit of a reunion for a handful of folks that were in on the brew day with me as an interloper. All agreed that the beer has held up quite well and the tasting crew that came out for it put a decent dent in the 1/2 keg. Cheers, guys, you can certainly be proud of this one! While I haven't checked for certain, since this was tapped nearly a week ago, I'd be surprised if it was still on tap. So, given that, this may be just about the most useless beer review that I've shared thus far. Unless, of course, there's yet one more keg hiding in some great beer bar's cellar. You know how those cellars can get.